On the 9th February 1666, George Hamilton was born at Hamilton Palace, Lanarkshire. George was the fifth son of William Douglas-Hamilton, Duke of Hamilton and his wife Anne Hamilton, Duchess of Hamilton. A successful soldier and statesman, he would become the first British Army officer to be promoted to the rank of field marshal. In May 1684, George Hamilton was commissioned as an officer in His Majesty’s Royal Regiment of Foot (The Royal Scots). The colonelcy of the regiment was held by his uncle, George Douglas, Earl of Dumbarton. Following the Glorious Revolution of 1688, Hamilton served William of Orange and in June 1689, during the Williamite War in Ireland, Hamilton became Lieutenant-Colonel of the Regiment of Enniskillen Foot. Hamilton would go on to lead the Enniskillen Regiment at the battles of the Boyne and Aughrim and the sieges of Athlone and Limerick. 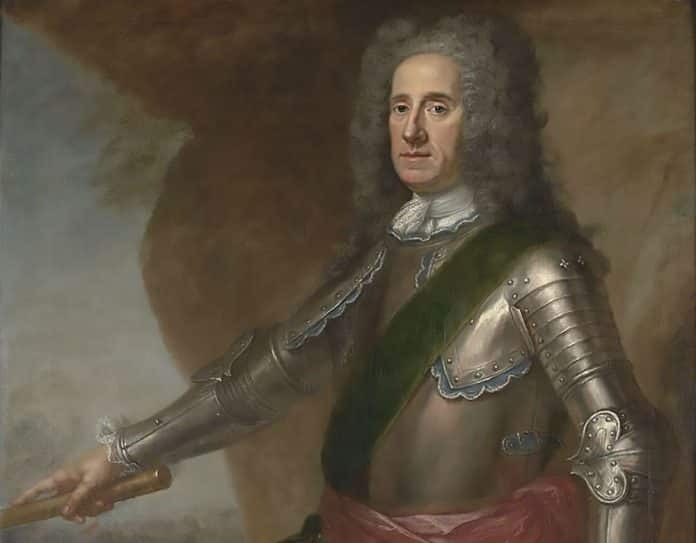 Following the war in Ireland, Hamilton became colonel of the Royal Fusiliers in January 1692 and commanded them at the Battle of Steenkerque in August 1692, during the Nine Years’ War. In late 1692 Hamilton became colonel of his uncle’s former regiment, the Royal Scots. Following the battle of Landen in July 1693, Hamilton was promoted to the rank of brigadier and was present during the siege of Namur where he received a serious injury. Hamilton married Elizabeth Villiers in November 1695 and in January 1696 he has created Earl of Orkney, Viscount Kirkwall and Baron Dechmont in the Scottish peerage. In March 1702, Hamilton was promoted to major-general and fought under John Churchill, Duke of Marlborough, during the War of the Spanish Succession. Further promotion came in January 1704 when Hamilton was made a lieutenant-general. Hamilton served with great distinction under Marlborough, most notably at the battles of Blenheim, Ramillies and Malplaquet, becoming one of the Duke’s most trusted subordinates. In 1736, Hamilton was promoted to the rank of field marshal, the first British Army officer to be given the rank.